Doncaster Knights closed out their 2017-18 Championship campaign in seventh place following their 30-26 final day defeat to Jersey Reds at Castle Park. 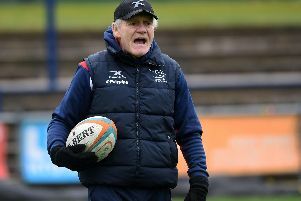 Director of rugby Clive Griffiths, who shared the view of many of the third biggest crowd of the season when it came to controversial decisions by the officials, admitted the game reflected the club’s season. “It was a case of the good, the bad and the ugly,” said the Welshman. “We’ve only won nine league games all season, which is hugely disappointing. “But we’ve also picked up 19 bonus points which is a record for the club and which shows that in most of the games we’ve lost we were very much in contention. “People might moan about some of our results but looking at our points for column you can see the intent to play is still there. “Playing an expansive game can have an adverse effect on your points against record, however, and that is not as good as we would like it to be. Griffiths admitted that the game was lost in the first half when Jersey came in leading 22-7. “It could have been closer had we taken our chances and decisions gone our way but it was disappointing and we made too many mistakes,” he said.